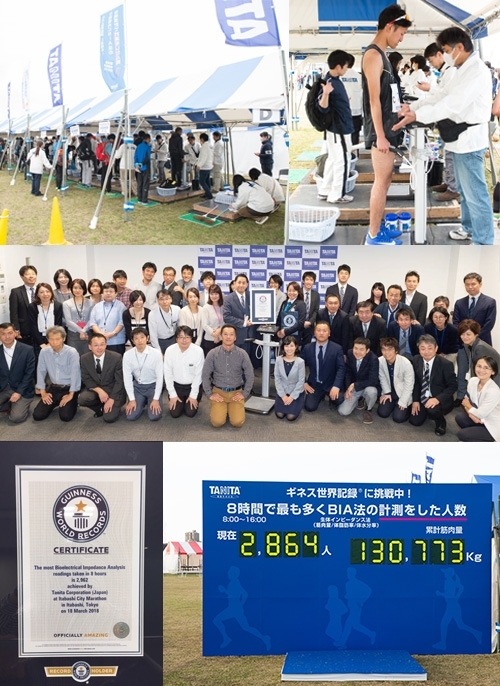 Thanks to the latest TANITA invention – the Pioneer Hand-to-Hand Segmental Body Composition Analyser DC-13C, around 3,000 participants across generations have taken their body composition readings without takeoff shoes in “Itabashi City Marathon 2018”. Without the need of takeoff shoes before measurement, this innovative DC-13C allows a full body BIA analysis to complete as short as 40 seconds, while offering the best measurement accuracy for readings including Weight, Body Fat %, Muscle Mass, Bone Mass and Total Body Water level. Thanks to this technology breakthrough fast, hygienic mass body composition measurement in events and retail environment is now made possible. This event was proudly archived in the Guinness World Record, which also marked TANITA’s success and determination in promoting “Constant Health Monitoring” concept to the society.